Super Bowl 44 Ads: SuperBowl XLIV Commercial to Include Google? 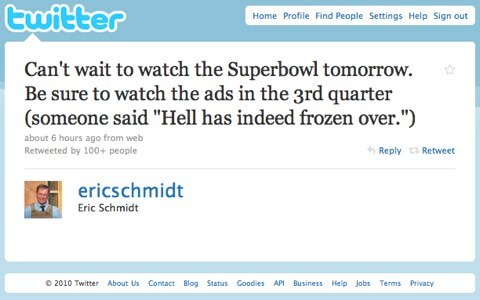 Homeads Super Bowl 44 Ads: SuperBowl XLIV Commercial to Include Google? USA TODAY has listed the advertisers slated to run Super Bowl 44 ads for 2010 and that list is 58 commercials long, constituting a total of about 35 minutes. There are eight that run for a full minute, three listed as N/A and one rumored (based on a tweet from Google CEO Eric Schmidt) commercial from Google that is not listed at all. Pete Cashmore from Mashable thinks that the rumored Google ad will either be one already available on YouTube called “Parisian Love” (below) or an ad for the new Google Nexus One phone. The USAToday List of Super Bowl 44 advertisers includes the standard beer (5 Bud 3 others) commercials, ten car related ads (VW, Kia, Hyundai, Honda, Dodge & Audi brands, along with Cars.com, Bridgestone). There are five restaurant commercials (3 Denny’s, 1 Papa John’s, 1 Taco Bell) while snacks (3 Doritos, 1 Snickers Candy bar, 1 Emerald Nuts mixed with Pop Secret), and 2 sodas (Dr. Pepper Cherry & Coke) make up seven more ads.